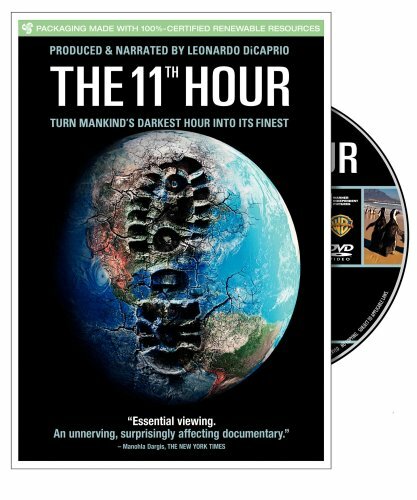 The 11th Hour is a 2007 documentary film, made, handled and depicted by Leonardo Dicaprio, on the state of the earth. “The 11th Hour” is the last moment when change is possible. The film explores how we’ve arrived at this moment – how we live, how we impact the earth’s ecosystems, and what we can do to change our course. Featuring ongoing dialogues of experts from all over the world, including former Soviet Prime Minister Mikhail Gorbachev, renowned scientist Stephen Hawking, former head of the CIA R. James Woolsey and sustainable design experts William McDonough and Bruce Mau in addition to over 50 leading scientists, thinkers and leaders who discuss the most important issues that face our planet and people. Narrated by Leonardo DiCaprio, written and directed by Leila Conners Petersen and Nadia Conners. The 11th Hour is produced by Chuck Castleberry, Brian Gerber, Conners Petersen and DiCaprio. Global warming is not only the number 1 environmental challenge we face today, but one of the most important issues facing all of humanity … We all have to do our part to raise awareness about global warming and the problems we as a people face in promoting a sustainable environmental future for our planet. Ray Anderson – Founder, Interface, Inc.
Disclaimer: This is no longer the official website of the 11th hour film.